In this study, distribution of Melibe viridis (Kelaart, 1858) which is an alien dendronotacean nudibranch (Gastropoda) in Turkish Mediterranean Shores is determined. This mollusc was observed on a soft sediment bottom (sandy) covered with algal beds mainly composed of Ace-tebulum acetebularia, neptun grass (Penicillus capitatus) and the invasive chlorophyta Cau-lerpa scallpeliformis. One specimen of M. viridis was observed during SCUBA diving activity in Konyaaltı beach at a depth of 12 meters, 4 September 2011, in the Gulf of Antalya. Mediterranean records of Melibe were origi-nally referred to as Melibe fimbriata (Alder and Hancock, 1864), but as pointed out by Gosliner and Smith (2003) in their systematic review of the genus, Rudman (1999) could find no con-sistent characters for separating Melibe fimbriata from Melibe viridis, and suggested that the for-mer be considered a junior synonym of the latter. 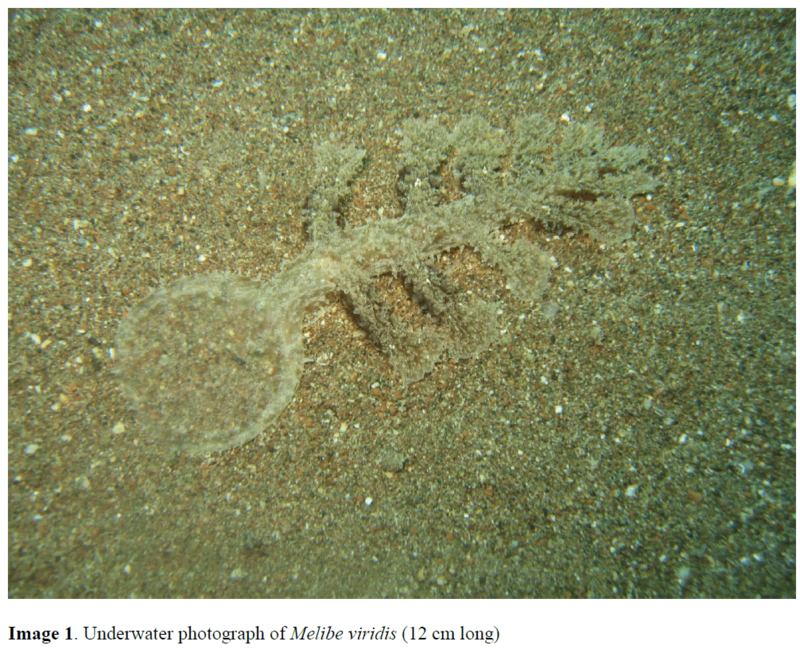 The Mediterranean Melibe is now accepted as Melibe viridis (Rudman, 2004; Zenetos et al., 2008). One specimen of M. viridis was encountered by scuba divers on 4th September, 2011, during a marine benthic survey of the Gulf of Antalya (Image 1). The site (centred on 36° 51.309'N, 30° 37.816' E) where the nudibranch was rec-orded, is characterised sandy, with bi-stones and pebbles, at a water depth of 12 m. Extensive algal forests (on bedrock and large boulders), together with meadows of Penicillus capitatus, Caulerpa scallpeliformes, surround the soft bottom where the nudibranch was encountered. M. viridis was recorded for the first time in the Gulf of Antalya and reported previously in Mersin shores, Fethiye bay (Yokeş and Rudman, 2004) and Marmaris (Cem, 2011), (Figure 2). Figure 2. Map showing the localities where Melibe viridis species were found in Turkey Coasts (latest record in red). Body large, resembling a mass of vegetal de-bris, with large cerata and a greatly dilated and rounded oral hood around its mouth, fringed with retentive tentacles. Rhinophores very small and lamellate, emerging from tall sheaths, into which they can be retracted. Large cerata arranged along the notal edge (up to 10 pairs), easily au-totomized and regenerated. Each one is oar-like shape, with a cylindrical stem and a flattened distal blade. Surface of the body and cerata bearing tubercles and ramified appendages (gills). Somewhat translucent with a pale yellow-brown or greenish ground color. The tubercles are brown, and the branched appendages paler. The rate of marine biotic invasions to the Mediterranean Sea has increased in recent dec-ades (Galil and zenetos, 2002). The successful invasion through the Suez Canal of a great many Red Sea species into the Mediterranean is seen as a process to which most of these species were preadapted in the littoral environment of the Red Sea (Por, 1971). Morever some of them already adapted themself to new substrats and replaced native species. As a result of this invasions many lessepsian molluscs have been reported to occur on the coasts of the countries (Çevik and Öztürk 2001). The biodiversity of Turkish Mediterranean shores are considerably increasing. M. Viridis is an alien gastropod which is adapted itself to the Turkish Mediterranean coast. In this study it is shown that it can be found throughout Turkish mediterranean shores. According to the findings, new detailed studies are needed to monitor the distribution of the alien species and their relation to na-tive and endemic species in the Turkish Mediterranean Shores. Because it becomes necessary to ensure its continuous updating and revision and promote more systematic efforts supported by modern taxonomi. Boero, F., Féral, J.P., Azzurro, E., Cardin, V., Riedel, B., Despalatovi´c, M., Munda, I., Moschella, P., Zaouali, J., Fonda Umani, S., Theocharis, A., Wiltshire, K., Briand, F., (2008). I – Executive Summary of CIESM workshop climate warming and related changes in Mediterranean marine biota, CIESMWorkshop Monographs 35, pp. 5–21. Çevik, C., Öztürk, B., (2001). A new lessepsianmolluscHypselodorisinfucata(Ruppell&Leuckart, 1828) (Gastropoda: Nudibranchia) for the coasts of Turkey, Turkish Journal of Zoology, 25: 27–30. Galil, B.S., Zenetos, A., (2002). A sea change. Exotics in the Eastern Mediterranean. In: Leppäkoski, E., Gollasch, S., Olenin, S., (eds). Invasive aquatic species of Europe: distribution, impacts and management, Kluwer Academic Publishers, Dordrecht, pp 325-336. Por, F.D., (1971). One hundred years of Suez Canal -A century of lessepsian migration: retrospect and viewpoints, Systematic Zoology, 20(2): 138–159. Yokes, B., Rudman, W.B., (2004). Lessepsianopisthobranchs from the southwestern coast of Turkey; five new records for the Mediterranean, Rapport du Congrès de la Commission Internationale pour l'ExplorationScientifique de la MerMéditerranée, 37: 557.